Automatic stem creation solution for producers and DJs separates songs into three parts: vocals, drums and remaining music. With the latest updates to Audionamix XTRAX STEMS fully-automatic stem creation solution, producers and DJs can further enhance their creative processes. The software’s newest features include a faster, advanced algorithm, higher-fidelity drum processing and a fully-adjustable, real-time separation balance matrix with presets. These updates provide heightened separation ability for live sets, mashups and remixes. XTRAX STEMS automatically separates songs into three parts: vocals, drums and remaining music. Its simple workflow is optimized for DJs and remix artists looking to separate songs into stem components for easy remixing, sampling and a cappella creation. 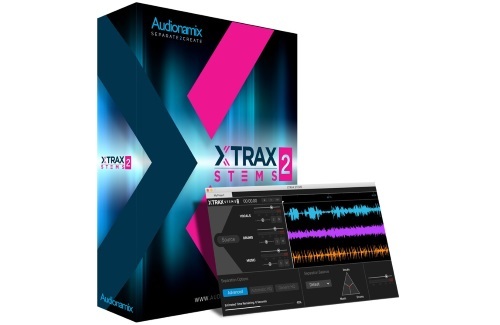 XTRAX STEMS 2 is equipped with an advanced algorithm offering 30 percent faster stem isolation. The faster advanced algorithm also dramatically improves separation quality, particularly when creating backing tracks and separating lead, background and harmony vocals into a single stem. Drum stems will also benefit from improved, higher-fidelity processing. This increased separation quality also reduces drum interference in vocal and music stems, meaning with XTRAX STEMS 2, all separated stems are much cleaner. “XTRAX STEMS 2 elevates our core stem creation solution with improved algorithms, faster processing speed, and higher quality results, which can be optimized further with the new separation balance tools,” says Maciej Zielinski, CEO of Audionamix. The software is compatible with both Windows (7 SP1 – 10) and Mac (10.12 – 10.14) operating systems. Current XTRAX STEMS customers can download XTRAX STEMS 2 as a free update, while new users can purchase XTRAX STEMS for $99.